Remember what we all feared when Avast acquired Piriform earlier this year? Well, our fears were right. The latest version of CCleaner's installer now includes Avast Free Antivirus as a bundled adware. You would think that Avast would have learnt a lesson in bad press, when its servers which hosted Piriform's system utility, were compromised back in September. Version 5.33.6162 of CCleaner and CCleaner Cloud 1.07.3191 were hacked by an unknown party and a malware was embedded in it, to collect user data from systems on which it was installed. Though that security issue was dealt with, Avast has taken a step in the wrong direction again by bundling its antivirus, in to CCleaner. We tested the latest version, CCleaner v5.37 on our PC, which has Kaspersky Internet Security installed on it, and we didn't get the Avast offer during the installation. We already had CCleaner v5.36 installed on this PC. But I did notice that a large portion of the installer's window was blank, like an ad was missing there. So, I fired up a VM, on which CCleaner was not installed. It did have another antivirus on it, and this time, we saw the Google Chrome ad for it. Monitoring the network connection of the installer, I found that it sent some data to a Singapore server (Softlayer Technologies) and to Avast's server. I think it is safe to say, that CCleaner detects if you have an antivirus installed, and sends the information to Avast's server, and you probably won't get the antivirus option in the setup process. A thread on Avast's forums hints that this issue began in v5.36. Softpedia points out that the option to install the Avast Free Antivirus is pre-enabled by default, which means, if you aren't paying attention during the install, you will end up with the antivirus on your PC. 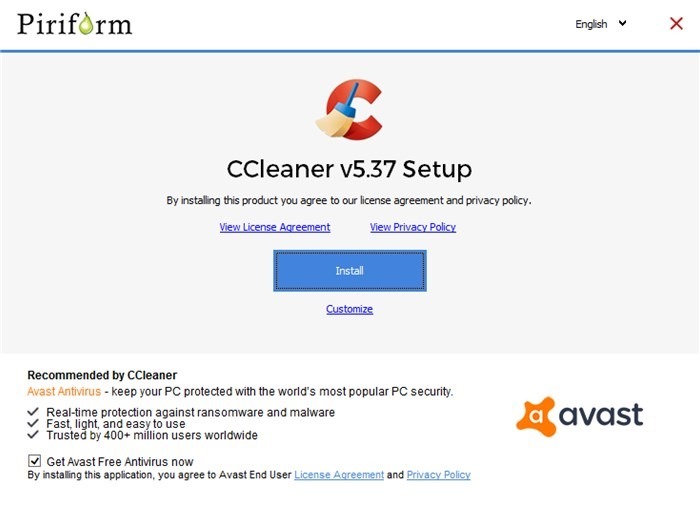 Ghacks reports that the portable version of CCleaner does not contain the installer for Avast. So, that is probably your best bet for now. Note: We don't hate Avast, it is good as a security software. But its aggressive advertising, is not cool.